We’d love your help. Let us know what’s wrong with this preview of The Meaning of Meaning by Charles Kay Ogden. Language is the most important of all the instruments of civilization. This is the premise of a work whose significance to the study of language, literature, and philosophy has remained undiminished since its original publication in 1923. New Introduction by Umberto Eco; Indices. To ask other readers questions about The Meaning of Meaning, please sign up. Books about philosophy of language always make my head go round in circles. This one did, too. But if you take the time to read and re-read the important bits, you gain an understanding of the importance of the subject and maybe even an understanding of the "Meaning of Meaning" itself. One of the main points the book makes is the prevalence of the "proper meaning superstition" and the fact that there can be no serious discussion of the philosophy of language prior to its abolition. The proper mea Books about philosophy of language always make my head go round in circles. This one did, too. But if you take the time to read and re-read the important bits, you gain an understanding of the importance of the subject and maybe even an understanding of the "Meaning of Meaning" itself. 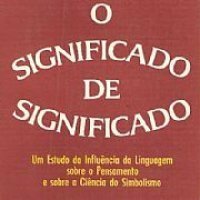 One of the main points the book makes is the prevalence of the "proper meaning superstition" and the fact that there can be no serious discussion of the philosophy of language prior to its abolition. The proper meaning superstition is the (false) belief that every word has one exact meaning and that this meaning is part of the word. According to the authors, meaning does not reside within the words but within the humans using them. To explain their concept of the relations between referent (what a word is used to refer to), symbol (a word) and reference (the connection between symbol and word, i.e. the interpreter), the authors introduce the model of a semiotic triangle. In this triangle, each of the three related entities (referent, symbol and interpreter) is assigned an edge: Referent in the lower right-hand corner, symbol in the lower left-hand corner and the reference on the top of the triangle. The most fundamental proposition of the book can be reduced to the assertion that there this triangle does not have a basis: There is no direct connection between referent and symbol (contrary to the proper meaning superstition). Symbol and referent are only related through an interpreter, who translates the symbol into a referent or vice versa. Having established this basic proposition, the authors go on to analyze sign-situations in general and symbol-situations in particular. A sign is a natural representation of something that exceeds the sign (a barking sound may be a sign for a dog, for instance). A symbol, on the other hand, is a special kind of sign: It does not have a natural connection to its referent (unlike normal signs), but only a purely conventional one: The word "dog" is only connected with dogs because it is used to refer to dogs. Were the word "madgs" used to refer to dogs, the word "dog" would have no connection whatsoever with a dog. The first thing to consider when talking about language is thought, simply because their is no use of language without thought. The special case of thought that must be examined before language can be dealt with is the interpretation of signs - the interpretation of symbols is only a special sub-case of this activity. The interpretation of signs is stated most concisely by the authors themselves as being "our psychological reaction to it [the sign], as determined by our past experience in similiar situations, and by our present experience" (p. 244). So when we hear a dog barking, we assume that it is a dog because in our past experience the barking sound has generally been accompanied by the existence and close proximity of one of these creatures. The same interpretative process applies for symbols. 1) One symbol stands for one and only one referent. 2) Symbols which can be substituted for another stand for the symbolize the same reference. 3) The referent of a contracted symbol is the referent of that symbol expanded. 4) A symbol refers to what it is actually used to refer to. 5) No complex symbol may contain constituent symbols which take the same place. 6) All possible referents together form an order, such that every referent has one place only in that order. Of course, there are other ways of defining symbols, but most of them are specific to a special subject (such as legal definitions) and most (if not all) of them can be reduced to the eight mentioned above. One of the most interesting ideas of the Theory of Definition is that there are definitions that do not mean anything and therefore act purely as irritants, supporting a particular orator simply by confusing his audience. Such irritants must be recognized and ignored. Examples are Croce's "the sublime is everything this is or will be so called by those who have employed or shall employ the name" and - to the date my favourite - Ziercke's "Etwas vom Gesetzgeber Verbotenes dem öffentlichen Zugriff zu entziehen, kann keine Zensur sein". 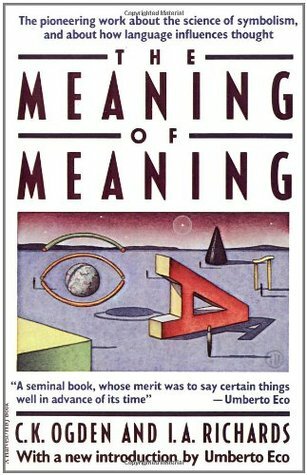 Armed with the theory of definition, Ogden and Richards set out to search for the meaning of beauty and the meaning of meaning in the next two chapters. In the final chapter (called "Symbol Situations") the authors finally apply their theory of interpretation to so-called symbol situations. Their analysis of the processes of language interpretation is separated into the side of the listener and the speaker. The side of the listener is not very complicated, as he behaves quite exactly in the same way as he does when interpreting signs: The only new idea is that of complex symbols. A listener may interpret two symbols in each others context and that may give him a new referent (other than the two simple referents of the two symbols each). More generally speaking, there are two important functions of language: The strict symbolization, in which facts are transferred from one to another. And the evocative or emotive use of language, which aims to promote certain emotions and feelings within the listener. The confusion of these two has been responsible for much of the discussions and controversy between scientists and poets. In many ways, this is a very unsatisfying book. Since it is written in the early 20th century, coming with this book is a reading of structuralism that is not quite formed, but definitely in full swing. The title is apt, but also guaranteed to be a let down, because if anything the book doesn't come close to providing any meaning of meaning, although that is what it is about. As considered, the text was revolutionary for its time. You can see that the two rhetoricians went far in their attempt to In many ways, this is a very unsatisfying book. Since it is written in the early 20th century, coming with this book is a reading of structuralism that is not quite formed, but definitely in full swing. The title is apt, but also guaranteed to be a let down, because if anything the book doesn't come close to providing any meaning of meaning, although that is what it is about. As considered, the text was revolutionary for its time. You can see that the two rhetoricians went far in their attempt to flesh out the topic of their book. But given its inconclusiveness, what were they hoping to do? How can anyone write a book with this little conclusion? Nonetheless, apparently this text was highly influential for its time. I gave it two stars because I am reading it today, although if I read this 70 years ago (I wasn't alive 70 years ago) I may have felt differently. Nonetheless the title is apt, because they are looking at the whole of language for meaning. Despite their formalistic leanings, they fail to recognize that meaning is inherent only within a logic when viewed from the outside. Meaning in this sense is orientation -- but it is not a fixture of a system. When you are within a system, the very rituals and gestures attain a meaninglessness about it. So they do recognize this; but also fail to reconcile that meaning is produced when you are in one logic moving within a different logic. In other words, within the logics of language there is transcendence and there is immanence. The dialectical interaction between these two, respectively "inside" and "outside" create the experience of meaning. Still, there is much information to be gained here, although it is a preliminary text. In this sense, as an influential marker of the time, it is well worth studying, although our grasp on the subject has passed this book up. I suppose in this sense, as a relic, it is more like an open letter; some experts writing to any other experts out there, who might care to respond. And in that sense, it is meaningful. But as a precise marker of the conversation today, it is meaningless since it doesn't add anything -- it presents no new logic, no new formalistic relations we might use, so to speak. Okay. Less fun than Philosophy of Rhetoric was, and less immediately applicable to rhetoric. Darn structuralists--seems like I'm becoming quite well-read in them quite inadvertently. There are maybe 3 or 4 chapters that are fulfilling, and, admittedly, it took a little cross-research to understand what they were shooting for. On the plus side, I got to contribute to Wikipedia on this one. Can I count that as a publication? Supplement II reinforced my nominalism.